I live on the West Coast. I have for almost 6 years now, and I love it. I love the mountains, the ocean, the people, the attitude. I suspect I will stay here for a very long time. My biggest knock on this side of the country, in fact, is the lack of my family. My family has a long tradition of being to the east. While Toronto isn’t really that far east, despite what Vancouverites say, I do have family all the way down the coast, from Nova Scotia to Florida. And I was born over there too in Washington D.C..
It’s been hard today not to spend the whole day looking at pictures of the devestation from Hurricane Sandy. It was hard last night to sleep, knowing my sister was alone in Brooklyn with only broccoli in her fridge. It was tough not to think about my relatives in Boston and my friends in Washington. So I did what I always do when I panic. I cooked. I didn’t make anything fussy, or fancy, or particularly hard. 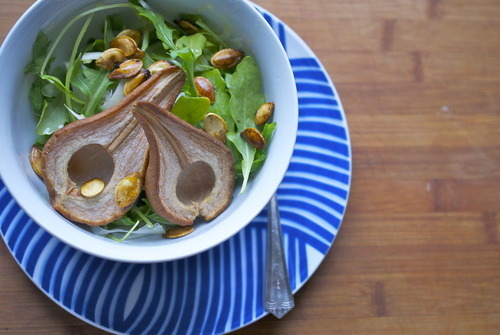 I made a simple salad, with roasted pears and pepitas and I ate it watching the news, convinced the wind was going to knock down my sisters building or that my cousins would be washed away with the tide. But there was something, something little, but something none the less, about the roasted pears that made me feel better. 4 cups Baby Arugula or other sharp greens. 1 cup Fresh squash/pumpkin seeds, or dried. 1/2 head Fennel, thinly sliced. Using a melon baller, or a small spoon, cut out the core. Put the pears face up on a baking tray, rub with a bit of olive oil and bake until pears are cooked through, about 30 minutes. In a small frying pan heat up 1 tbsp of the olive oil. Add in the seeds and cook until lightly browned. Salt generously and mix in the rosemary. Remove from heat and allow to cool. In a large bowl mix together the vinegar and mustard. Slowly add in the remaining oil and mix well. 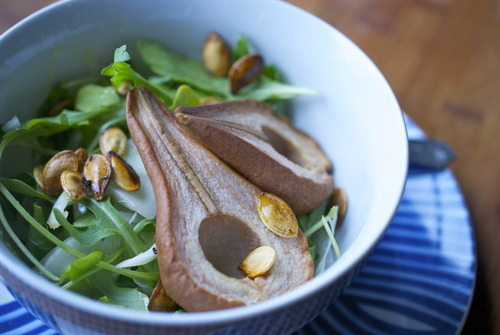 Mix together the arugula and fennel and toss with dressing. Top with pepitas and pears. Serve immediately.